John Haines was born in a lakeside town in Upstate New York. After a few early years in Texas, his family moved to California during the early days of Silicon Valley, when there were still remnant orchards from the “Valley of the Heart’s Delight”. Through the family gallery of a teenage friend, Haines was introduced to the works of Abstract Expressionist and Bay Area Figurative painters, establishing a core aesthetic that would remain in his work. After high school he attended Otis Art Institute in Los Angeles, a seminal time in which he worked for Frank Gehry, David Hockney, and Sam Francis. Sensing a deeper interest in the history of art, Haines traveled to Europe, where he spent 2 years searching out art from the Paleolithic to the Renaissance. 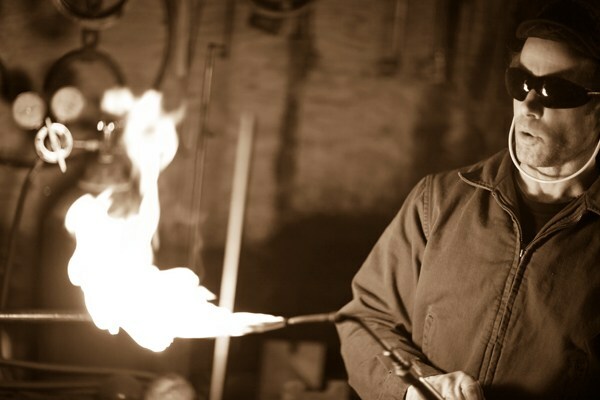 Returning to California to work, he studied stone carving at Cabrillo College in Santa Cruz, and continuing his interest in metal sculpture he took a blacksmithing class to forge carving tools. Revisiting Europe for several more years, Haines lived in Florence Italy working in the trades and exhibiting his works. Upon returning to California to create a studio, he worked with Master Blacksmith Toby Hickman, Petaluma, and has been in the Bay Area since. Haines now lives in the hamlet of Monte Rio on the Russian River, and works from his studio in Guerneville, California.